Accessing your seat of government is not easy for citizens of Knoxville and Knox County, as I experienced this week. Parking and walking is not too bad, for those of us in good health. The problem is, as with any city, finding a good place to park. Parking on the street is problematic most of the day. 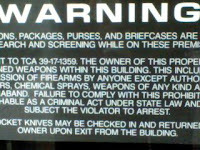 Going to the City-County Building means you can't take your defensive firearm, so what do you do for personal defense between the time you get out of your car in the garage, and your arrival at the C-C? 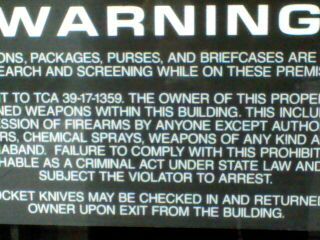 As you can see from the picture, pocket knives (the sign says legal pocket knives) can be checked at the door. So, while the criminal can choose whatever he wants if he decides to waylay you, you are limited to a medieval (very) short sword. Keep in mind that the best way to win a fight is to avoid one. Always be vigilant. Be observant, and stay in condition yellow, as I mentioned in my Examiner Starbucks piece. Be aware, also, that the Tennessee Theater on Gay Street and the East Tennessee History Center, 601 Gay Street are posted; as are Cafe 4 and Preservation Pub in Market Square. Then there is Krutch Park, which like all Knoxville City Parks, is posted. Now, here is an interesting twist in Tennessee law. Seems that if you use a handgun in legal self-defense, you don't need a permit to carry. TCA 39-17-1322 states, "A person shall not be charged with or convicted of a violation under this part if the person possessed, displayed or employed a handgun in justifiable self-defense or in justifiable defense of another during the commission of a crime in which that person or the other person defended was a victim." [Acts 1994, ch. 943, § 1.] Now, you figure that one out. Much of the recent news from Arizona has focused on SB1070, the immigration law. Almost unnoticed is the fact that Arizona's Constitutional Carry law goes into effect this Thursday. Many Arizona police don't like it. They decry the fact that people will be able to carry concealed sans permit. Now, Arizonans have been carrying openly without permits for years. Why do they think that sixteen square inches of cotton will turn a good citizen into an evildoer? That hasn't happened in that bastion of conservatism, Vermont, where you couldn't get a permit if you tried. Nor has it happened in Alaska, which has had permit-less carry for several years now. Will blood run in the streets? NO! And one thing is for sure, states that ease restrictive gun laws usually see a drop in violent crime, as reported by Massad Ayoob. Read the research in John Lott's book, More Guns, Less Crime, available at Amazon. That said, if you keep and/or bear a weapon, you have an obligation to get training in its proper use. The Tennessee Legislature should be bold, and pass Constitutional Carry next year. The story as reported above and in the Knoxville News-Sentinel, remind us that due to the nature of things, police encounters can be quite dangerous. It appears to me, based on the reports, that this was a justifiable shooting by the Oak Ridge Police. Meanwhile, let's turn our attention to what happened in Vegas. Police there shot and killed a West Point graduate who allegedly drew down on them. Facts are not as clear in this case. A coroner's inquest will be held September 3. What can you learn from these incidents that may save your life one day? If possible, don't bring a knife to a gunfight. Then let them do whatever they want to do. Now, you think about what you are going to do. Make your decision today. Maybe you will never need to do this, but better to plan ahead. And, keep your mouth shut. You have the right to remain silent. Exercise it. The Orange County Register reports that a retired police officer lost a lawsuit against Glock, and just about everybody else. What went wrong here? The child had access to the gun. Was the officer guilty of criminal negligence? Some say that law enforcement officers should be the only ones with guns. Those folks should move to Great Britain, which is as devoid of guns as Ireland is of snakes. But wait, Great Britain, surrounded by water, has had a significant increase in 'gun crime' since their virtual ban on gun ownership. Los Angeles Superior Court Judge Kevin C. Brazile made a good decision in this case.While it is tragic that Chavez was left paralyzed from the waist down, it's not anyone else's fault. Even Chavez, being a member of the human race, should be allowed to make an error. But as a result of his error, he is wheelchair bound. Glocks have a reputation for safety, and will not discharge under practically any circumstances, as long as the trigger is not depressed. Chavez should just man up and admit his mistake, and make the best of the life he has. Today, we learn that Shirley Sherrod, of the U. S. Department of Agriculture (USDA), was asked to pull over to the side of the road and resign. Not too long ago, you will remember, General McCrystal resigned over things said in the presence of of a Rolling Stone reporter. Not to worry, this not unique to employees of the Obama administration. From time to time, bigwigs and politicians speak off the record, only to later learn that nothing is off the record. And, this is not the first time someone at USDA has been forced out due to vocal indiscretions. Does anyone remember Earl Butts? COMSEC can and should be practiced by all. In a Knoxville News-Sentinel article this week, Bruce Wayne Cromer Jr., of Stovall, NC, is reported to have received a 150 day sentence for killing an elk in the Great Smokey Mountains National Park. U.S. Magistrate Judge Dennis L. Howell ordered Cromer to forfeit his rifle for destruction, according to the Citizen Times of Asheville. The rifle, autographed by NASCAR racing legend Richard Petty, apparently fits into the evil object category, at least according to the Magistrate. Move over, Chucky. Seems like Hizzonor might have considered having this firearm auctioned, with the proceeds going towards retiring the national debt, or towards elk herd management, or...... The provenance of this rifle, while not rising to the height of a Dillinger piece, would probably help fetch more than fair market value on GunBroker.com. And, of course, had this happened in a Tennessee (not Federal) park, state law now prohibits this type of destruction. For gun owners, Ron Ramsey is the clear choice! Today is the first day of early voting in Knoxville, and the State of Tennessee. Get out and vote. There were no responses from Wamp or McWherter. Candidate responses to the Tennessee newspapers' survey appear here, with my commentary here. Haslam states he kept Knoxville the 'most gun-friendly big city' in Tennessee, yet is on record as urging City Council to keep Knoxville Parks as gun free zones. Maybe we should call this the 'least gun-unfriendly big city' in the state. See the video HERE. Wamp has missed umpteen votes in Congress since he started running for Governor. He broke the term limit pledge. Will he break others, also? Is Ramsey perfect? No, but a far better candidate that the others. He walks the walk. Vote early, and if you live in Chicago, vote often. Suppose you call 911, and nobody comes. That idea seems far-fetched, but if you are in Oakland, California, as Brian Williams reported tonight, this is you reality. Now for the rest of the country, this is not currently a problem, but . . . suppose there is a major weather disaster, or another terrorist attack. How high on the priority list do you really think you will be. Odds are, if you need the police, they won't be able to come. Even under normal conditions, it usually takes more than ten minutes for them to arrive. If your home is being invaded, you can only depend on yourself. Just like with car insurance, seat belts, and fire extinguishers, the time to prepare is beforehand. If you are thinking about arming yourself, now is the time. And, of course, you need training. I previously wrote on the absurdity of the Knox County, Tennessee fireworks ban. Only those operating with licenses are allowed to use them. The result is that there are beaucoup scofflaws in Knox County. As for me, if I am to spend money on things that go bang, I'll stay legal, and ammo is better. . . and, on July 4th, as I sat on my front lawn and watched all those illegal fireworks being fired, I had my pistol on my hip. This precipitated a nice conversation with a neighbor who was unfamiliar with the firearms heritage we have in the United States. Thanks to the Supreme Court, the inherent right to bear arms must be recognized by all political subdivisions of the United States, whether tin-horn potentates like Chicago's Mayor Daley want to recognize it or not. Thank you, Liston, for the opportunity to blog here on your site, which I read. McDonald v Chicago, together with the Heller decision, are cornerstones in the repaired foundation of American liberty. Their significance cannot be overstated. Much will be written about them and you are probably already reading many takes on the opinions. But, what if you are a big gun-controller? How do you regroup after this staggering defeat? And, make no mistake: McDonald and Heller are routs to the gun controllers. The Left is punch-drunk, but recovering quickly to determine their next move. That move will NOT incorporate rational re-thinking of their cowardly eagerness to relinquish this precious liberty--the individual, personal, real honest-to-goodness, applied, practical right to arm with firearms. Paul Helmke., President of the Brady group of cowards so eager to turn in guns, exemplifies their fallback position. Now, understand, you will not get a clear, honest statement of their position. You must infer that from their spin. 2) We will glumly wait hoping that 5-4 will become 4-5. We will not accept this Supreme Court's reactionary reasoning (spoken with disdain); we must, instead, wait for better days. 3) In the meantime, we will NOT concede that this is a victory for the right to keep and bear arms crowd. We will, instead, spin this from what few cookie-crumbs we can fantasize from the opinion and make it sound like we are happy about it. We will pretend to have won. At least, we will NOT say that we lost, even when asked directly. 4) What about the fact that all of those people out there actually like the opinion, like the right to own a gun, and support this medieval decision? Well, that makes our true colors untenable. We cannot be honest about our intent, which is to strip away that right from the American citizen, leaving strictly a government monopoly on arms. A) We support the right to keep and bear arms. B) We are not against guns. C) We are OK with (some) guns in the hands of (some) trained, stable citizens, so long as these guns are under careful control and safely kept. D) McDonald means that the states and cities may impose all manner of reasonable restrictions, so it really didn't mean much. McDonald is limited to its holding [Which is true--all opinions are limited to the facts of the case and the holding, unless you are Justice Stevens who presumes to the authority to make whatever law he wants.] that a municipality may not prevent a law-abiding citizen from keeping a firearm in the home for self-defense. E) The official Brady position is now that we must all focus on regulating these firearms "reasonably." Wow. Paul Helmke is not against guns. They are in utter disarray. Their post-McDonald positions will continue to develop. They will sound more and more strange all the time. You will have to listen very closely to what they are saying to discern from which direction the next attack will come. Do not expect any truth. For example, they will continue to lie about the ease of buying a weapon, particularly at a gun show, as if a gun show is some sort of leftist street demonstration where all law and order breaks down. But, Brady may repair their platform and re-state their Marxism in any way they want. The Supreme Court found the Second Amendment to state a personal, individual, and fundamental right to keep and bear arms and this elevates the right. State and city governments that, before, presumed to the arrogant authority to put gun owners under the ban are now far less free to write all manner of mischief statutes and ordinances effecting restraints on bearing arms. Period. This is like a hard punch smack in the face of the Brady losers. We hold these truths to be self-evident, that all men are created equal, that they are endowed by their Creator with certain unalienable rights, that among these are life, liberty and the pursuit of happiness. . .
Happiness cannot be pursued by, and liberty is unavailable to, those whose life has been cut short before they see the light of day. The knife of the abortionist has killed far more Americans than did the planes of the 9-11 attackers. Would it bother us more if they used guns? The unalienable right to life is meaningless without the means of preserving life. The personal firearm has proven time and again to be the best instrument for that purpose. Anyone who would deprive you of that instrument is misguided at best, or at worst, has leanings toward despotism, as did King George III. Every year we celebrate July 4th, Independence Day, with backyard barbecues, friendly gatherings, and fireworks. Knox Countians dutifully gather at the Worlds Fair Park, and watch the authorized fireworks show, set to music. But wait, not all of us are downtown, because lots of folks gather in neighborhoods and shoot roman candles, bottle rockets, and assorted fireworks, and celebrate the 4th in a more personal way. The problem is, fireworks are illegal in Knox County. This has worked well for fireworks dealers at the Loudon County line. . . but, it must be a source of confusion for the children. "Johnny, we should always obey the law. . . Ya wanna go over to Dixie Lee and get some bottle rockets for the 4th?" It's time for the Knox County Commission to reverse this silly law.